And remember to check my unboxing video... I "unbox" the device itself on it too. Great pics JKK! Hey... I noticed my HP mini seems to be bowed around where the HDD would be. When you're able to put yours back together, can you confirm if yours is bowed too? Mine just seems raised, not sure if it's because of the HHD if it's thicker than the SSD. I kind of wish I've gotten the one with the SSD, so I'm looking for any excuse to return this one and exchange it. Any suggestions between the two different drives? Lol, did you even turned the device on? Just kidding, keep up the good work. Cant wait to hear what SSD upgrade options are available. Currently this device remains undesirable in either configuration due to its poor drive performance. Get back to us as soon as you can! Nice pics... Does RunCore have a SSD for this machine. I know for a fact that Mtron has a 1.8in Pata SSD for HP Mini 1000. In fact of their sales guys sent me some pictures on how to install it. Great job!!! 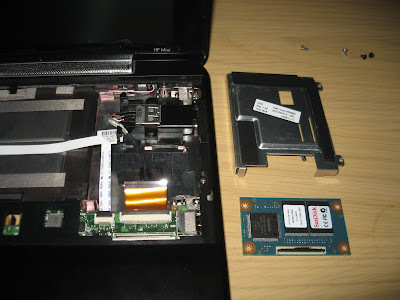 I was reading in various sources that HP mini 1000 has also a SIM slot behind the battery. Also some lucky owners reported that their minis are equipped with the 3G card too. Since I haven’t spotted any SIM slot on the pictures above, can you please confirm that it ex-ists on the one you disassembled? "Great job!!! 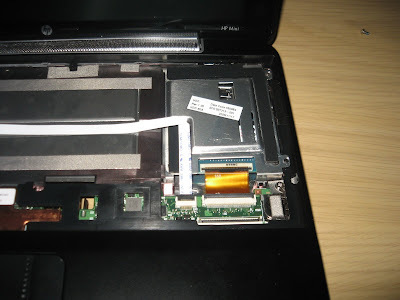 I was reading in various sources that HP mini 1000 has also a SIM slot behind the battery. Also some lucky owners reported that their minis are equipped with the 3G card too." the sim card slot is near to battery bay , google it ..
jkk--Can't quite see that SSD connector there. 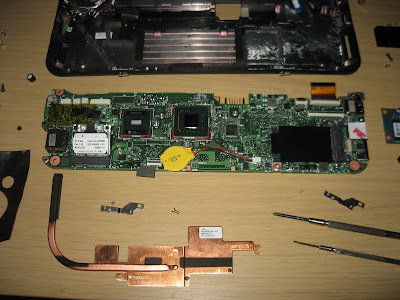 It looks like it ISN'T the mini-PCIe the Eees and Dell Mini 9 are using. I assume this is because they support both hard drives and SSDs. Presumably this is a PATA interface rather than SATA. Hey, JKK, can you tell us anything about the recessed USB port, the HP Mini Mobile Drive Slot? Would a standard USB extender cable let you use the slot as a standard USB port, or did HP do something to it to prevent such a thing? Also, is the connector is proprietary, could you remove it and solder on a standard USB port. I plan on picking up an HP Mini 1K, but I hate the hard drive options. I would sacrifice the 3G for a better hard drive. Doesn't the 120GB iPod classic use a 1.8 inch drive? HP's being cheap! 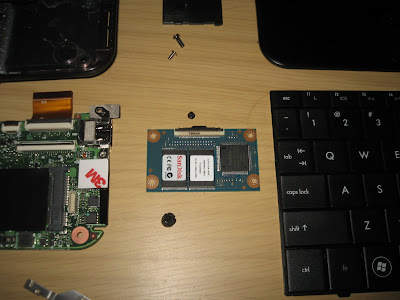 SSD connector is 40 pin ZIF, it's PATA. HP Mini Mobile Drive Slot is normal usb port, but inside the device. You cant get extender to reach it as the hole is too small. One could cut the hole bigger and move the USB connector closer to use it as 3rd USB port. Wait for my SSD tests as I have a new SSD coming which will have great speed and price.. I see an extra PCI-e slot, could that be used for a secondary SSD? or perhaps a faster primary SSD? What is the new SSD that you are going to put in the Mini 1000? what is the common model name for the mini 1000 you dissected? i have a 1030NR from bestbuy and it lacks the bluetooth module. i am trying to assess if it will be easy to add the module or will there be roadblocks to this upgrade? 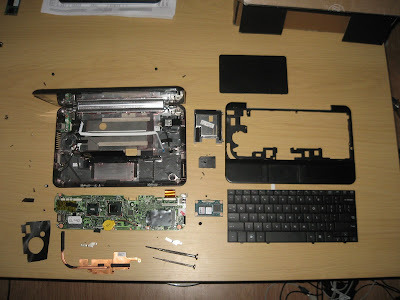 Hi, Is it possible to buy a hp mini 1000 in EU? Any suggestion? It looks like the bluetooth module goes on the bottom right hand corner at the open plug, on top of the 3M double sided sticky pad. The part number is 507706-001 however it is not available for purchase from HP parts and I have not seen it available anywhere else either... I will post an update if I find it. Well that actual part is not available anywhere, not from HP parts, home and office, or business. 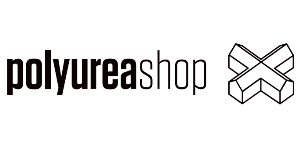 Nor is it available from their recommended 3rd party parts companies. 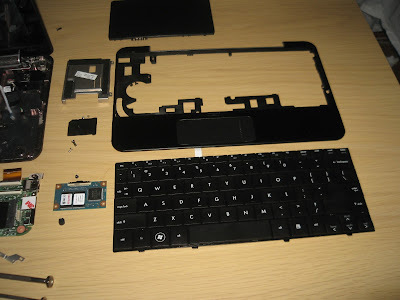 I am going to purchase a 379191-001, I think this part will work in the Mini, it is the part that comes in the older HP netbooks. hi, this is the anonymous bestbuy shopper again. This is a long shot, but has anyone out there with a mini 1000 that has bluetooth preinstalled taken a peek inside their unit. Maybe the bluetooth module installed is not HP proprietary and has other identifying markings that can be found from other manufacturers. 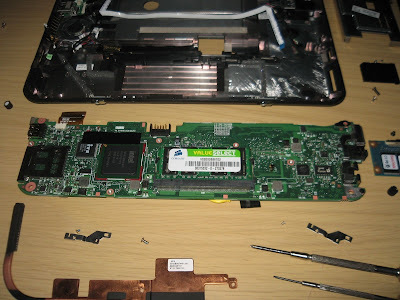 Hi JKK, I was able to use your dissection walkthrough to upgrade the SSD in my mini 1000 to an Mtron Mobi 3000 32GB 1.8" pata zif SSD and that thing is wicked fast now. The difference in perf on my laptop between the old and the new SSD is like night and day. Thanks! 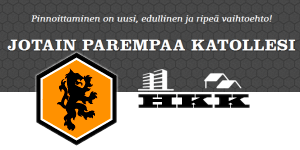 JKK, Great Review! My unit came with XP Home and seemed extremely slow. I wiped the HD and installed Ubuntu 8.10. I immediately noticed a massive speed improvement over XP. I still think the 16Gb SSD is a bit slow, hdparm is only showing 34.56 MB/sec for reads. Looking forward to your speed posts from the SSD upgrade. excellent dissection. I just got the 16GB version and have to say its pretty slow! Installing quicktime took over 15 minutes. But hey, I did pay only $400. Has anyone tried installing a 2GB RAM chip in this yet? I think someone told me that the system limit is 1GB but just wanted to double check. If it does work, is there any performance difference? Thanks. yeah, i just put in a 2gb ram chip by corsair and it works great. 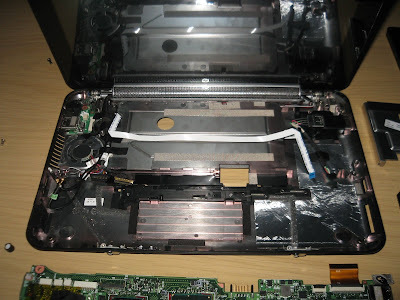 Do you think you can put in the 128gb SSD drive used in the macbook air in this machine? I've been trying to find a place to buy it on the net but the biggest one I can find is the 32gb Mtron. Is there anything bigger? I modified a usb extend cable to use in the Hp mini drive port. works great. How did you modify it? Do you have any pics? I havent bought this yet, but if i did could i just use an external hard drive and run everything off of that? jkk, can you do a bluetooth mod on the mini 1000, and video record it? you can see the 3M tape, left and down you can see the bt connector. Can I put any PATA 1,8" hdd in it? I contacted HP via their online support, and he said he could not sell me the internal bluetooth adapter or a Verizon 3G card so I could install it myself. I wonder if there is any other way to get my hands on these devices, or am I stuck trying to return this HP mini and ordering one directly from HP with the modules I need? in the 7th pic, is the wireless card on the left that's sticking up a bit? If so, can i replace that with a wireless-N card. As you know HP only puts wireless b/g card in it. There appears to a white powder/substance behind the protective screen/bezel on my hp 1000 mini. It's not really noticeable when the screen is on. I've try an air blast to dislodge, but to no avail. Any ideas on how to remove/pry off the LCD bezel? What is this stuff? Talcum powder used during assembly? I hate to return this unit to HP for such a minor thing. Has anybody found a good deal on a 507706-001 bluetooth? You can get them from HP for $60, but that's a rip off. The hard drive is so slow. I feel like it's running with speeds of an SD card. Horrible. Although I like the computer there needs to be some kind of replacement that fixes it. Does anyone know the brand and model number of the 16GB SSD in the HP MINI 1153nr?? 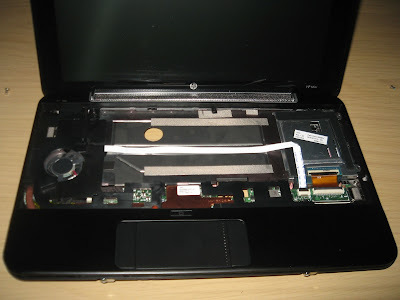 Can you tell me the model of the dissected HP Mini 1000 is what lcd connector ? Found this thread looking for a way to add BT to my mini. Since the internal source dried up before I got to it, I looked for an alternative. Thought the USB drive bay (on SSD Models only I think) might be an option. Bought a USB drive from HP to check it out (http://www.shopping.hp.com/store/product/product_detail/FY825AA ). Found a BT USB adapter that looked similar (http://www.dealextreme.com/details.dx/sku.17777) and it fit and works fine. If you do this, make sure you add some tape to create an extraction option as there is no other way to get it out, short of opening the unit. I'm running Win7 and had to add no additional drivers. The OS and Win Update found everything it needed to run my mouse. Haven't tried other profiles. Incidentally the HP drive, that seems to come in 4G only right now, is a plastic carrier for an AData slim USB stick c902. I can find up to 16G versions of this for sale, (http://www.elive.co.nz/adata-myflash-c902-16gb-usbdrive-dv1362.php) Looks identical and it would take nothing to swap the stick out of the carrier. Just click locks in. In case that might interest anyone. My mother-in-law gave me an HP Mini 1000, but she ordered one that only has the 8gig hard drive and with XP installed there isn't much left of the 8gigs. What are my options and I don't want to drop a boat load on a Solid State. Please help. 2 screws came out on the right hinge any easy fix ?